If you’re looking for a pretty red lipstick then Max Factor have released some beautiful options in their Marilyn Monroe Collection*. I am smitten with 3 Marilyn Berry but they’re all stunning. 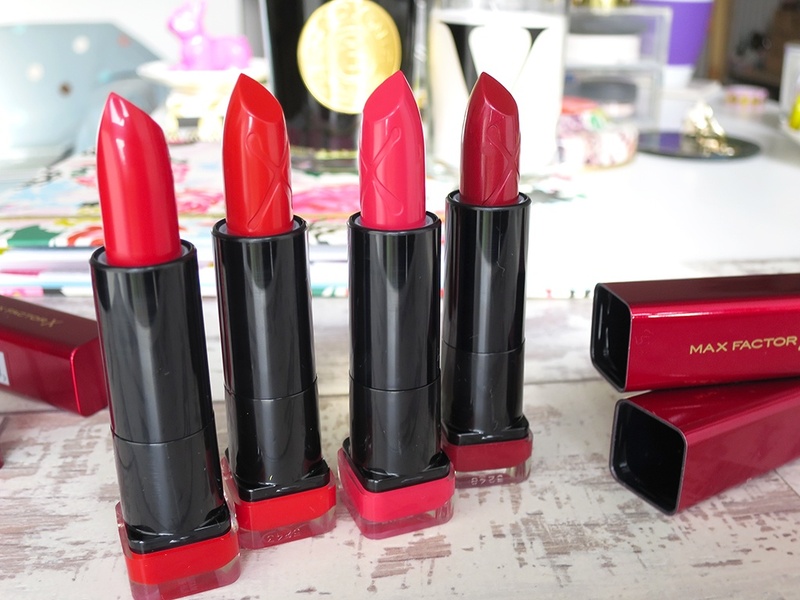 Max Factor were behind the iconic Marilyn red lip with their Ruby Red and Max Factor have added 3 new reds to their Marilyn Collection so every woman can find her one true red. Using undertones of orange, blue and purple, each shade works in harmony with individual skin tones of warm, cool and dark, to give a pop of bold colour. Which shade would you pick? Inspired by Marilyn. The original shade loved by Marilyn, this iconic colour is a bold, true red inspired by her career-defining red lip. This is a gorgeous vibrant red and I think a truly glamorous red. I find it hard to pull off such a bold lip but this is a show stopper of a red and If I had glitzy party to attend this is the shade I would opt for. Sunset red is a beautiful burnt orange/red shade, which will pop in warm or olive toned skin tones. I think this will be a gorgeous lipstick for the warmer months its not too fiery and is a very wearable orange toned red. This red will suit pale skin tones or cool skin tones. It has blue undertones which complement cooler complexions. This is my favourite of the four colours and I do tend to wear a lot of berry shades so this is well within my comfort zone. Its a beautiful and has a rich deep pink tone which looks a little more berry on the lips. I think this is the easiest of the four to wear, the most safe shade I guess. I think its gorgeous and I have worn it a lot these past few weeks. A rich, deep red with purple undertones, this is perfect for darker skin tones. Think luxurious full bodied red wines. Gosh this is a bold stunning really deep red and is quite a statement on the lips. The colour is very glamorous and sophisticated I haven’t worn this one out of the house yet but I am building up to it. The formula is silky smooth and just effortlessly glides on the lips. All the shades are vibrant and pigmented not to mention comfortable on the lips. They wear well but if you want your lipstick to look polished and give you that perfect pout then I would say use a lip liner – it will also ensure the colour doesn’t bleed throughout the day. You can really build up the colour on these to be very bold or if you want a red thats a little more subtle for daytime then just apply a small amount and blend it out with your finger. Thats what I have been doing. These lipsticks are enriched with nourishing grapeseed oil and avocado butter which will help keep your lips feeling soft and stop them drying out. The packaging of this new collection is bold and really pretty its bright red and gold and stands out in my collection. I like that you can see the colour at the bottom of the bullet so its easy to grab the shade you want. I wouldn’t of considered myself a red lipstick kind of girl but I do like that Max Factor have created a collecton that will suit everyone – very clever and If I had to pick my perfect red from the four it would 100% be Number 3 Marilyn Berry, although come the Summer I think I will be switching it up to Sunset Red. Have you tried any of the new Marilyn Monroe Collection or have you already found your perfect red?